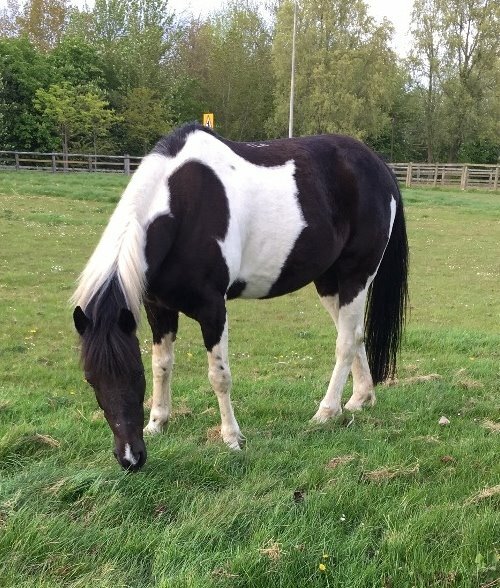 First up maybe not so fab, you've probably heard about the knife attack on a pony in Milton Keyenes well he has his own FB page so that everyone can keep up to date with his progress Domino's Diary. Now for something much more cheerful, Shelley Oldfield founder of Bodmin Moorland Pony Rehabilitation ( the rescue that saved Panda our Rescue Pony of Week ) has been named Animal Welfare Champion 2017 at the Pirate FM Local Heroes Awards. Huge Ponyhour congratulations to Shelley. Did you have a hobby horse as a child well now there's competitive hobby horsing. 95 year old Prince Philip may have announced his retirement but he's still carriage driving. New cantilevered lightweight saddle set to revolutionize saddle fitting & design. Photo of Domino taken before the knife /hammer attack is this weeks Ponyhour Pic of the Week.